Colin Hovde, Robert Bowen Smith & Kerri Rambow. Photo Credit: DJ Corey Photography. 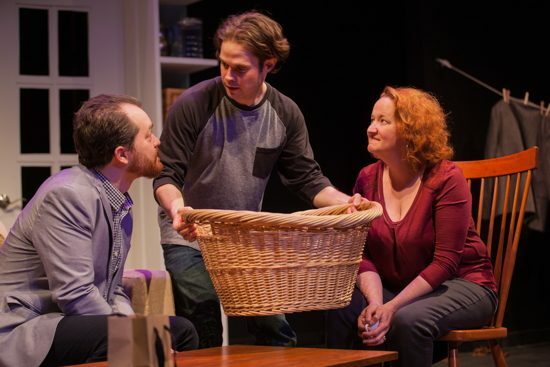 When you first enter the space for Hub Theatre’s latest production, you see what appears to be a typical domestic scene; French doors, some autumn leaves, a comfy couch, a couple of storage boxes with kids’ stuff strewn here and there, even a clothesline. Scenic designer Betsy Zuck has given us, in a few spare brushstrokes, all the tell-tale signs of a gripping drama to come. …a dramatist’s masterclass, an emotional roller-coaster of a play, and one that features some of the most stunning performances I’ve seen this season. In the taut, emotionally harrowing 85 minutes that follow, however, you are also given the rare chance to savor the work of a talented wordsmith at the top of her game, whose intricately woven dialogue is delivered with impeccable timing and nuance by a highly talented cast. Lauren Yee’s in a word is a dramatist’s masterclass, an emotional roller-coaster of a play, and one that features some of the most stunning performances I’ve seen this season. We come upon a couple torn apart by the kidnapping of their troubled young boy Tristan; two years on the mother Fiona remains distracted and obsessed by his disappearance, but for reasons that only become clear with time. Her husband, Guy, meanwhile, appears to be the sympathetic partner, but like Fiona, harbors more than his share of frustration, with a skeleton or two rattling away. With no new leads and the prospect of an investigation winding down, the time has finally come for the couple to turn their fierce investigative talents upon themselves, as they stumble into the future together. Yee’s accomplishment here is phenomenal, and in many ways is reminiscent of another brilliant writer of another age – Gertrude Stein – whose playfulness, like Yee’s, masked a deadly serious examination of our vulnerability. Matt Bassett’s masterful direction, Zuck’s setting and by Catherine Girardi’s discreet lighting enable us to savor some of the most finely crafted dialogue I have heard in years. Through deft repetition, reformulation and re-situation of even the most common of words, we watch as Fiona and Guy confront their darkest fears, leaping from the present to the past, from reality to insinuation, from trust to paranoia to hate, with each succeeding syllable. Kerri Rambow has been recognized before for her phenomenal work, and her performance here as Fiona is absolutely heart-stopping; Colin Hovde is a subtle stage partner, whose mensch-like veneer hides its share of secrets as well. Meanwhile, Robert Bowen Smith provides us with an astonishing range of characters surrounding the event of Tristan’s kidnapping—including Tristan himself. Smith’s shape-shifting is a joy to behold, and his protean talents are every bit a match for Yee’s constantly shifting words. A note on directions: The Hub Theatre, well worth whatever you have to do to get there, is quite close to the intersection of Route 50 and Pickett Road in Fairfax, Virginia; get there early, as there’s an awesome Ramen noodle house nearby, a confectionary, what-have-you. See this show! Running Time: 1 hours and 25 minutes, without intermission. Performances are now through April 24th 2016 at the John Swayze Theatre, 9431 Silver King Road, Fairfax, Virginia. Click here for tickets. Andrew Walker White has been a theatre artist in and around the Washington, D.C. area since the 1980's. His exploits include stints as a company member at Source Theatre (under Bart Whiteman) and the francophone company Le Neon Theatre (under Didier Rousselet). He is also a cultural historian, and his first book, Performing Orthodox Ritual in Byzantium, was published by Cambridge University Press--with more to follow. He has presented papers at Princeton and Oxford universities, lectured in Europe, and currently teaches as Humanities faculty at Stratford University in Virginia. Acting credits include Hamlet (title role), Cherry Orchard (Lopakhin), and Tennyson's seafaring epic Enoch Arden.